I have been creating a number of I have…Who has… games! First, my students L-O-V-E playing these games. I don’t even have to finish my sentence when telling them we are going to play, and I hear the yays spread throughout the room. The instant I whip out these cards, I feel like a superstar! 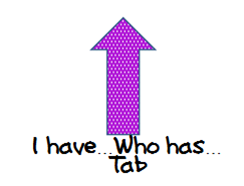 Second, playing I have…Who has… is great for differentiating instruction. Learning is being differentiated and students don’t even know. Each set contains a set of 24 game cards, directions for how to play I have…Who has…, and an answer key to keep track and help students along, if needed. These I have…Who has… games are so much fun, I felt they warranted their own page. Do you need a specific set of I have…Who has… game cards? I would love to hear what you are looking for and might be able to point you in the right direction!